I recently tried to update my YongNuo YN-E3-RT Flash Controller and ran into a few problems. It took me a while to figure it out but I finally got it to work. I thought I would share my experiences here because when I was searching for answers I couldn’t find them on line. 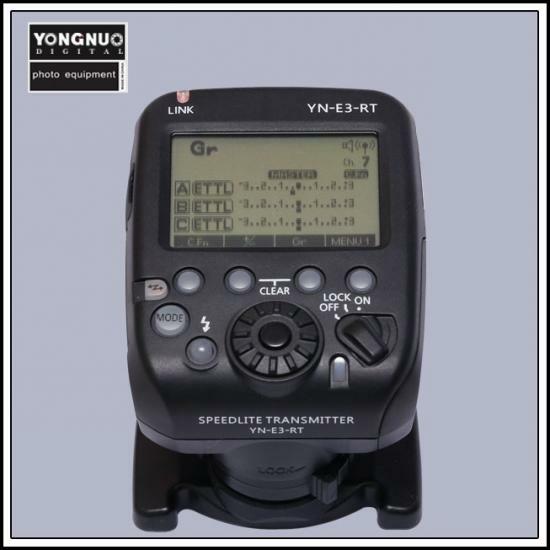 For those that don’t know the YN-E3-RT is a flash controller built by YongNuo that can be used in place of Canon ST-E3-RT radio flash triggers for either the Canon 600EX-RT speedlites or YongNuo’s YN600EX-RT flashes. The YN trigger sells for a lot less than the Canon one does and offers the ability to use rear curtain sync with both Canon and YN speedlites, something the Canon transmitter can’t do, and it costs about a third to a half the price of the Canon depending on where you purchase. It also allows non Canon shooters to use the Canon or YN radio speedlite systems albeit only in manual mode. I will be writing a more comprehensive review of this gadget a little later but first impressions have been good. The first step would be to download the updater and the firmware from YongNuo’s site. Here is a direct link to the Englsih page for the YN-E3-RT where you can get the firmware and updater. Currently it is Windows only so if you are on Mac you will either have to use a Bootcamp install of Windows or find a Windows machine you can borrow. I don’t know if a virtual Windows install on OSX will work. After downloading and installing the software on my HP Envy, Windows 8.1 machine. I ran the install which went without a hitch. I then unzipped the firmware file and selected it. I set the controller into firmware upgrade mode by holding down the mode button and turning it on, then plugged it into my machine via a USB cable (not supplied). The update software didn’t detect the controller but Windows did. I still couldn’t update the firmware. I tried closing the updater software, turning off the transmitter and then trying launching everything again. No joy. Next I tried a different USB cable, again no luck! The next step was to try re-installing the firmware updater in administrator mode and again tried both USB cables with no luck. I checked my device manager and could see an unrecognized device but was unable to install drivers. If I had looked a little closer I might have figured it out. Instead I downloaded the updater and firmware to my Windows 7, 64 bit desktop PC. I Ran the updater setup and noticed that it also did a driver install. I set the trigger in firmware update mode, plugged it into PC and was able to update the firmware on my trigger. I went back to my Windows 8.1 laptop and started looking around again. I opened explorer and went to the c:\Program Files(x86)\Yongnuo Trigger Updater\ folder and saw a driver folder I went into this folder and ran the dpinst_x64.exe file and it installed the appropriate driver. Set my YN-E3-RT to firmware update mode, connected via USB and it immediately recognized and would allow me to run the firmware update. After doing all of this I went back to the main folder and opened the readme.txt file. In this folder were the instructions to install the driver as I added above. If I had read that first I would have been able to figure it out much sooner. No where in the installation documentation that I read and downloaded prior to installing the updater does it say to run the driver set up program. In fact when the setup program for the updater finished running it asked me if I wanted to run the update software. I did say yes and figured that I would be able to update the firmware. Even being an IT Professional I would never have thought of going into the folder and reading the readme file. Had it popped up after the install I probably would have saved myself a little time. It didn’t take me that long to figure out the problems, maybe 30 to 45 minutes, but my goal is to help anyone that needs to update it to actually do it in the 10 or so minutes it should take. As I said earlier I haven’t played around with the trigger much since I have had it but the preliminary testing I have done, it has been solid with no issues. I have a few shoots coming up in the next little while where I was planning to give it more of a test. Any questions or comments please feel free to leave them below. If you felt this post helped and you want to help support the blog and have been considering buying the YN-E3-RT please use my Amazon link and help support the blog. This entry was posted in Gear, Products, Tips and tagged 600EX-RT, Canon, controller, firmware, flash, Mac, radio, speedlite, ST-E3-RT, trigger, update, Windows, YN-E3-RT, YN600EX-RT, YongNuo. Bookmark the permalink. Thank you very much for that! It saved my day while updating the YN-E3-RT. I had the same issues and this solved everything. Very much appreciated. I will keep it as a reference. Thaks for taking the time to write out your experience. Do you know if there’s a way to tell what firmware is already on my trigger and my 3 600ex’s? I am away and don’t have the units with me on this trip. I thought I remembered that there was a way of checking scrolling through the menus on the units themselves to see the firmware that is installed. Might be under the custom functions menu. Like I said I don’t have them with me t check right now. Improve your Photography, Build your Visual Library! Visit our friends at StrobPro.com for some great lighting and photography accessories!